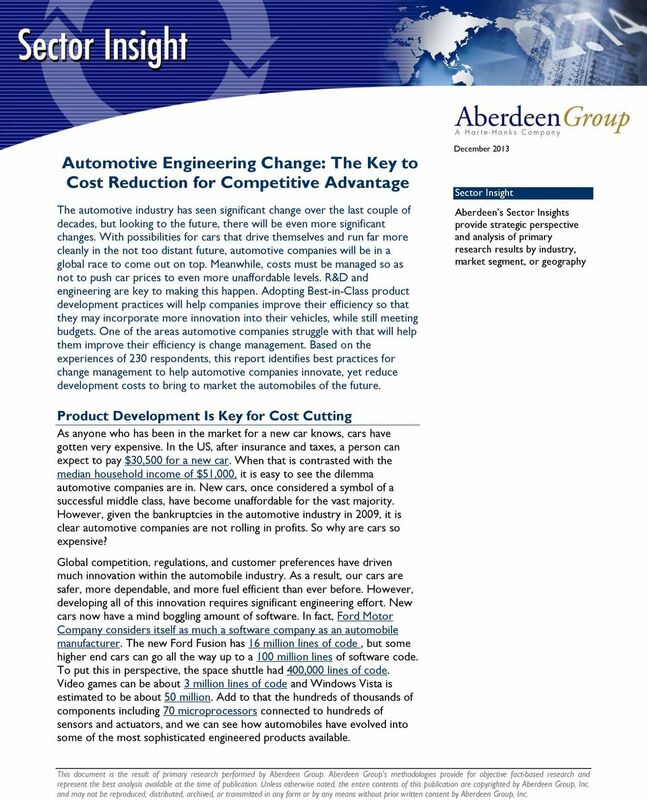 Download "Automotive Engineering Change: The Key to Cost Reduction for Competitive Advantage"
1 Engineering Change: The Key to Cost Reduction for Competitive The automotive industry has seen significant change over the last couple of decades, but looking to the future, there will be even more significant changes. With possibilities for cars that drive themselves and run far more cleanly in the not too distant future, automotive companies will be in a global race to come out on top. Meanwhile, costs must be managed so as not to push car prices to even more unaffordable levels. R&D and engineering are key to making this happen. Adopting Best-in-Class product development practices will help companies improve their efficiency so that they may incorporate more innovation into their vehicles, while still meeting budgets. 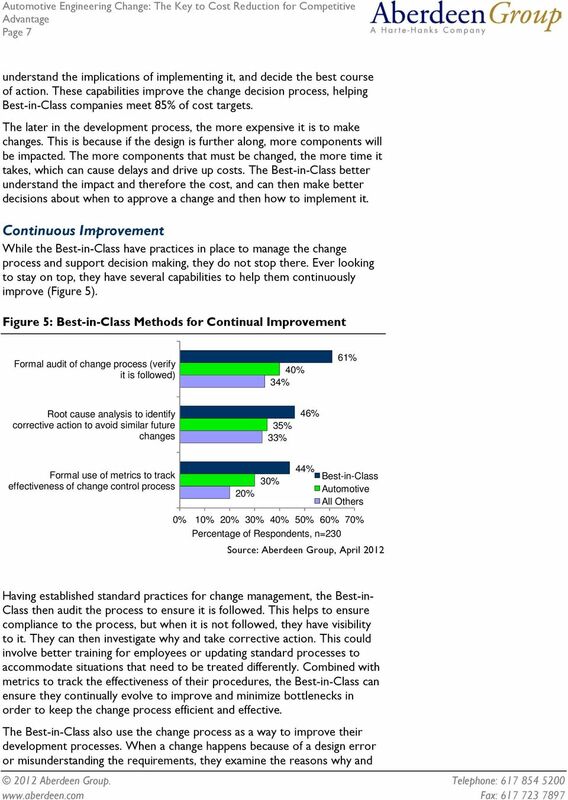 One of the areas automotive companies struggle with that will help them improve their efficiency is change management. 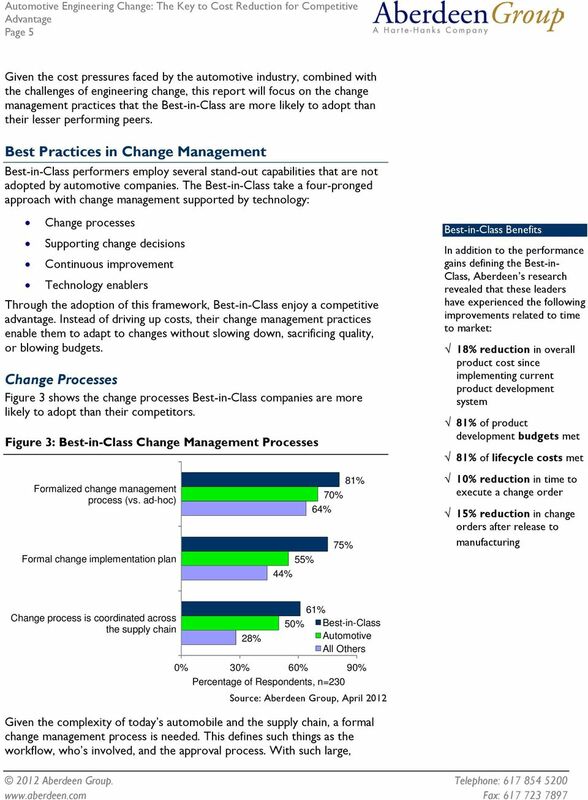 Based on the experiences of 230 respondents, this report identifies best practices for change management to help automotive companies innovate, yet reduce development costs to bring to market the automobiles of the future. December 2013 Sector Insight Aberdeen s Sector Insights provide strategic perspective and analysis of primary research results by industry, market segment, or geography Product Development Is Key for Cost Cutting As anyone who has been in the market for a new car knows, cars have gotten very expensive. In the US, after insurance and taxes, a person can expect to pay $30,500 for a new car. When that is contrasted with the median household income of $51,000, it is easy to see the dilemma automotive companies are in. New cars, once considered a symbol of a successful middle class, have become unaffordable for the vast majority. However, given the bankruptcies in the automotive industry in 2009, it is clear automotive companies are not rolling in profits. So why are cars so expensive? Global competition, regulations, and customer preferences have driven much innovation within the automobile industry. As a result, our cars are safer, more dependable, and more fuel efficient than ever before. However, developing all of this innovation requires significant engineering effort. New cars now have a mind boggling amount of software. In fact, Ford Motor Company considers itself as much a software company as an automobile manufacturer. The new Ford Fusion has 16 million lines of code, but some higher end cars can go all the way up to a 100 million lines of software code. To put this in perspective, the space shuttle had 400,000 lines of code. Video games can be about 3 million lines of code and Windows Vista is estimated to be about 50 million. Add to that the hundreds of thousands of components including 70 microprocessors connected to hundreds of sensors and actuators, and we can see how automobiles have evolved into some of the most sophisticated engineered products available. This document is the result of primary research performed by Aberdeen Group. Aberdeen Group's methodologies provide for objective fact-based research and represent the best analysis available at the time of publication. 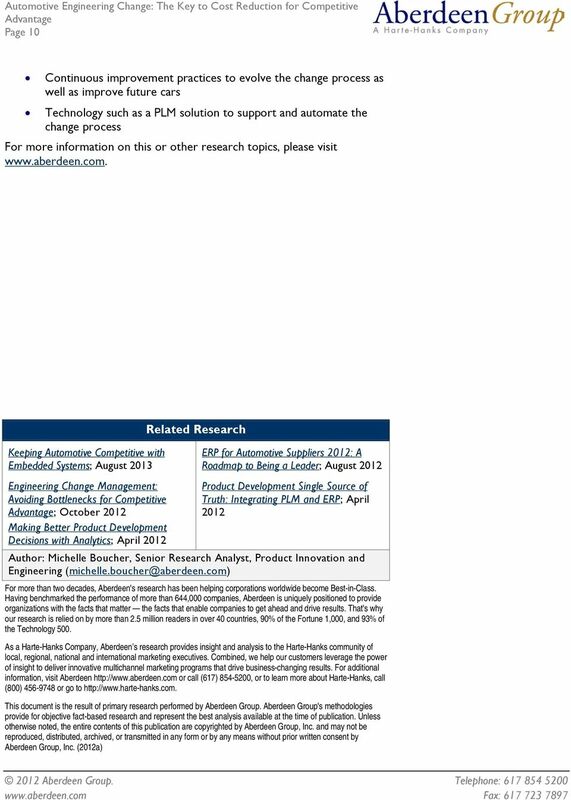 Unless otherwise noted, the entire contents of this publication are copyrighted by Aberdeen Group, Inc. and may not be reproduced, distributed, archived, or transmitted in any form or by any means without prior written consent by Aberdeen Group, Inc.
4 Page 4 least impact on schedules, even if it is not the most cost effective solution. 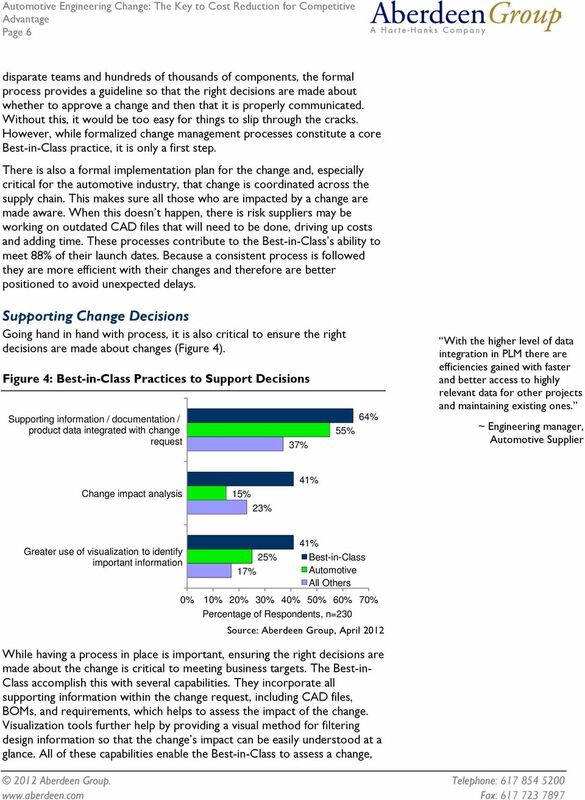 Inefficient change processes mean engineers and suppliers waste efforts working on outdated CAD models and other engineering information. All of this causes delays and drives up cost. This means investment in the change process is a way to take cost out of the vehicle. Maturity Class Framework To understand the steps with the greatest immediate impact on product development success, Aberdeen benchmarked the performance of study participants using metrics indicating design efficiency and revenue generation. 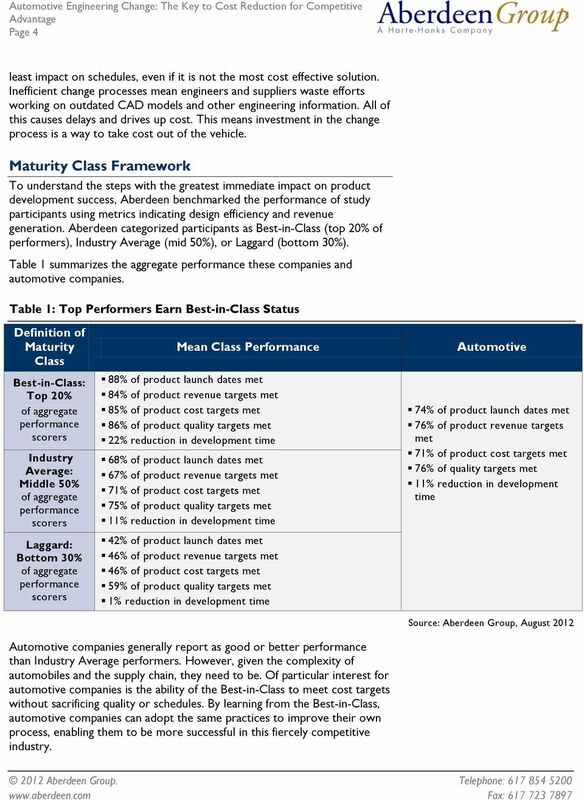 Aberdeen categorized participants as Best-in-Class (top 20% of performers), Industry Average (mid 50%), or Laggard (bottom 30%). Table 1 summarizes the aggregate performance these companies and automotive companies. Table 1: Top Performers Earn Best-in-Class Status Definition of Maturity Class Best-in-Class: Top 20% of aggregate performance scorers Industry Average: Middle 50% of aggregate performance scorers Laggard: Bottom 30% of aggregate performance scorers Mean Class Performance 88% of product launch dates met 84% of product revenue targets met 85% of product cost targets met 86% of product quality targets met 22% reduction in development time 68% of product launch dates met 67% of product revenue targets met 71% of product cost targets met 75% of product quality targets met 11% reduction in development time 42% of product launch dates met 46% of product revenue targets met 46% of product cost targets met 59% of product quality targets met 1% reduction in development time 74% of product launch dates met 76% of product revenue targets met 71% of product cost targets met 76% of quality targets met 11% reduction in development time Source: Aberdeen Group, August 2012 companies generally report as good or better performance than Industry Average performers. However, given the complexity of automobiles and the supply chain, they need to be. 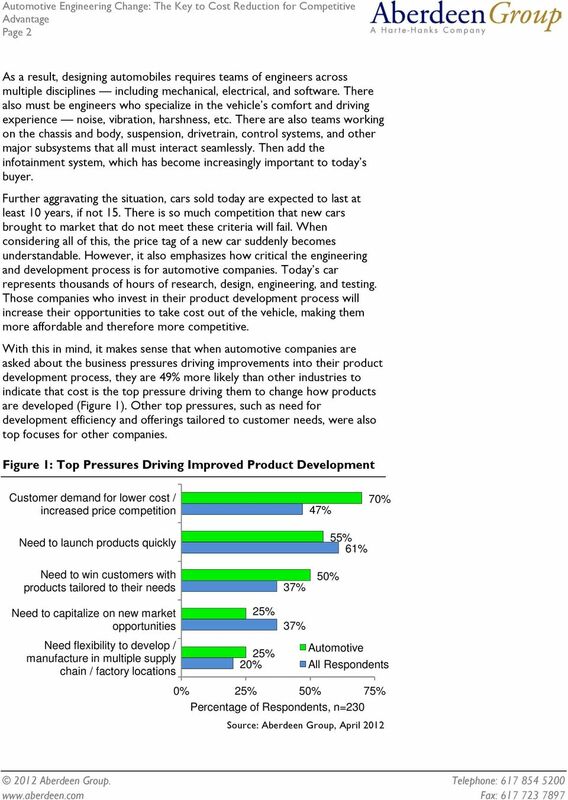 Of particular interest for automotive companies is the ability of the Best-in-Class to meet cost targets without sacrificing quality or schedules. By learning from the Best-in-Class, automotive companies can adopt the same practices to improve their own process, enabling them to be more successful in this fiercely competitive industry. 8 Page 8 use that to improve. For example, for clarity, perhaps updates are needed to standardize how requirements are defined. Another example could be updating simulation models and tests to look for similar problems in the future. Maybe design standards require tighter tolerances when a hole is at a given diameter. The result of this is better quality from the start, which helps the Best-in-Class meet 86% of their quality targets. Technology Enablers To support and enable these capabilities, the Best-in-Class also use technology. Given the complexity and amount of data involved with a car, Figure 6 shows enterprise solutions that the Best-in-Class use. 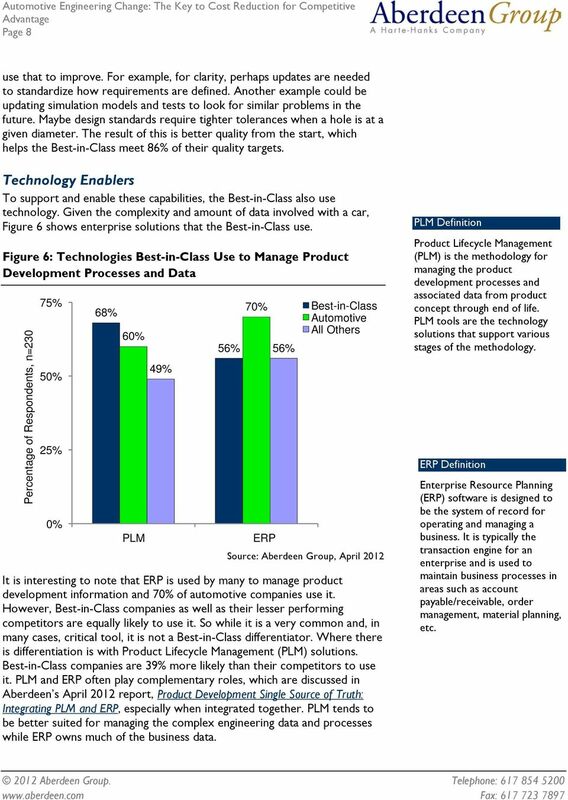 Figure 6: Technologies Best-in-Class Use to Manage Product Development Processes and Data 75% 50% 25% 0% 68% 60% PLM 49% 56% 70% ERP 56% Best-in-Class All Others It is interesting to note that ERP is used by many to manage product development information and 70% of automotive companies use it. However, Best-in-Class companies as well as their lesser performing competitors are equally likely to use it. So while it is a very common and, in many cases, critical tool, it is not a Best-in-Class differentiator. Where there is differentiation is with Product Lifecycle Management (PLM) solutions. Best-in-Class companies are 39% more likely than their competitors to use it. 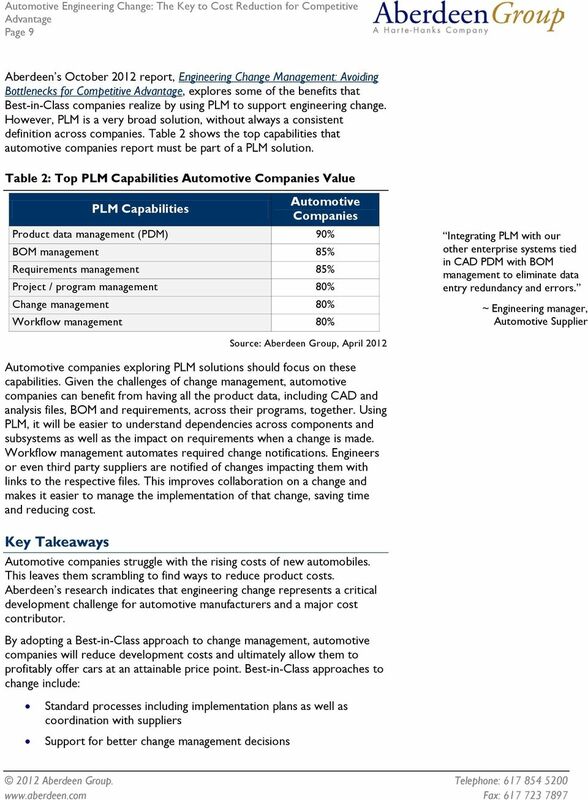 PLM and ERP often play complementary roles, which are discussed in Aberdeen s April 2012 report, Product Development Single Source of Truth: Integrating PLM and ERP, especially when integrated together. PLM tends to be better suited for managing the complex engineering data and processes while ERP owns much of the business data. PLM Definition Product Lifecycle Management (PLM) is the methodology for managing the product development processes and associated data from product concept through end of life. PLM tools are the technology solutions that support various stages of the methodology. ERP Definition Enterprise Resource Planning (ERP) software is designed to be the system of record for operating and managing a business. It is typically the transaction engine for an enterprise and is used to maintain business processes in areas such as account payable/receivable, order management, material planning, etc. Windchill and Microsoft Dynamics AX: Realizing Value through PLM and ERP integration Introduction Customers demand innovative products, making product innovation the lifeblood of any manufacturing business. BI in the Public Sector: Enhanced Efficiency with Data Discovery By their very nature, public sector and non-profit organizations are beholden to greater cost and efficiency standards than most companies. W ORLD CLASS ERP FOR SMALL BUSINESS? WHITE PAPER Data2Diamonds Turning Information into a Competitive Asset In today s business world, information management (IM), business intelligence (BI) and have become critical to compete and thrive. ERP vs. PLM: What s the Difference? 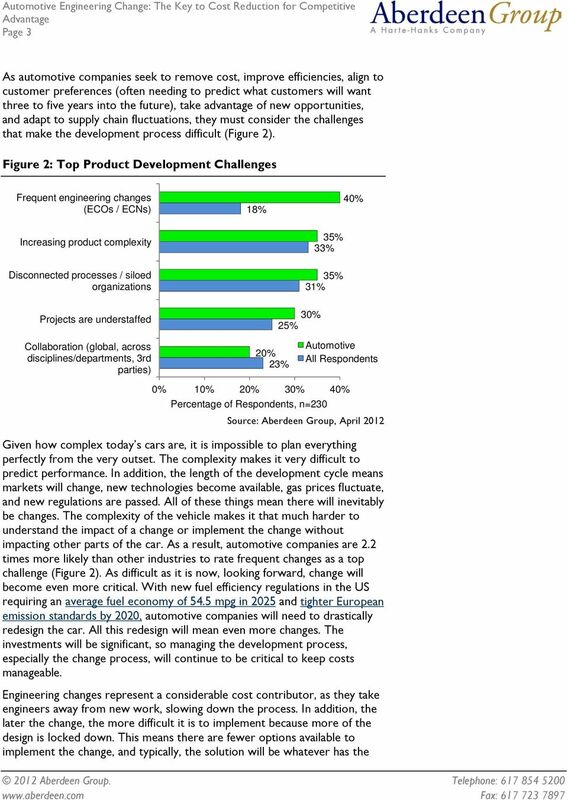 Engineering Change Management in the Automotive Industry When are you Finally Market Ready? The Product Lifecycle Collaboration Benchmark Report. The Product Profitability X Factor? Judith Hurwitz President and CEO Sponsored by Hitachi Introduction Only a few years ago, the greatest concern for businesses was being able to link traditional IT with the requirements of business units.